Discouraged by the industrial world which was not prepared to change the way of producing and advertising products, the Faltazi design studio started a new project named les Ekovores. It was hard for them to create an eco-friendly device and to promote it as such. Therefore they decided that people had to learn, to see that daily life products can and should be eco-friendly. Their idea was to create a collection of innovative urban furniture on the paper to make people think about what is possible, what could exist in the cities today. All those designs were concieved in order to create small economical loops where producers, consumers and investors will exchange products and money in a local scale. By doing so, they promote the concept of circular economy (see scheme in the pictures). They meet many professionals, associations, citizens and institutions to talk about the potential and credibility of their ideas, to improve them and to start raising awareness about these issues. Two associations where interested to work with them: Les Idéelles and Compostri. The idea of a new type of composter, a more practical one, was launched with the partners. 4 years after, the composter was produced and added to the neighborhood Malakoff in Nantes. Garbage collection found a new meaningful sense and had created new use of the public space. – Les Ekovores (meaning eaters of ecology in English) a project of Urban agriculture created by the design studio Faltazi. The aim of this project is to develop design to help cities to produce, develop and sell local products and to become self-sufficient. They were in charge of motivating people to use the composter through the creation of a team. – Les Idéelles: a group of women citizens who decide to create events and activities in their neighborhood to reclaim the public spaces. They started by creating an urban neighborhood garden on a lot in front of the building named the Garden”koff. Next to it they created a small and cheap composter. They contacted FALTAZI to help them improve this equipment. – Atoa, a company which promotes insertion in Nantes, helps to build the sheet metal doors to protect the composter. – Nantes Municipality – the city accepted to finance the project (after some negotiations). In this case the explicit urban furniture design was implemented, it was used to create a more practical object which is going to help to improve the life of the citizens. The composter had to be functional and beautiful, to have an added value in comparison to the other composters which were already used at the time. What are the innovations compare to a normal composter? The garbage is collected in a deposit box on one side of the composter. 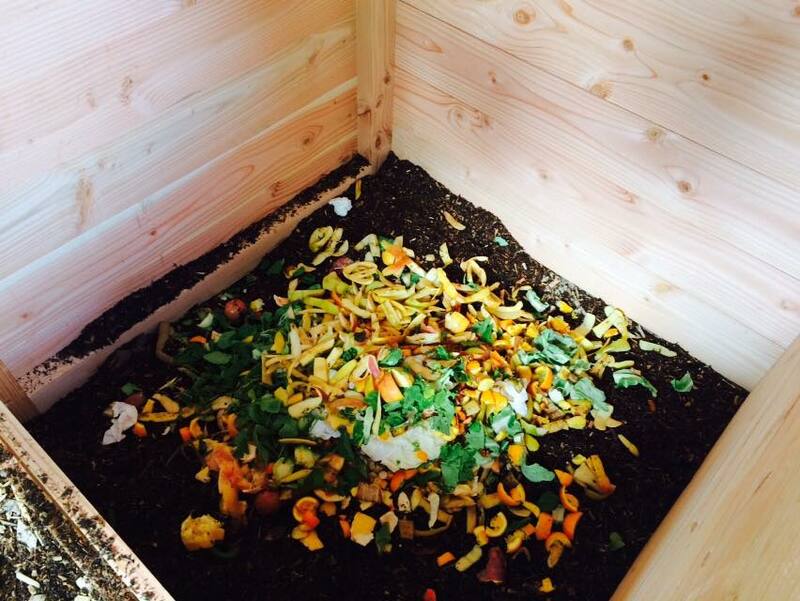 When this box is full, citizens have to transfer the garbage to the maturation box where the compost is created. Usually, farmers do this task thanks to a fork. In this composter, the designers created a system of levers to facilitate the transfer of garbage from one box to another. It is less time consuming and less of a physical task. To keep the compost fresh and humid, they created a water tank on the top of the composter. This water tank uses rainwater to operate. The composter is a part of the design project Les ekovores of Faltazi design studio. Their aim is to create new industrial design to promote a new way of living, more eco-friendly, local and participative. Next to this composter, other designs are already drawn such as an urination system, a kitchen, innovative greenhouses and henhouses etc. This all aims to create small loops of production, consumption or garbage collection in order to develop the local economy, to reduce the use of cars and petrol, to reduce noise in the city and to develop eco-friendly practices.